I've thought a lot about writing this post or not. It's one of the first stories about Georgia that I've really considered not writing, out of respect for her. I think about that more frequently as she's getting older and older and I wrestle with which stories are mine to tell and which stories are hers. Ultimately, I decided that I wanted to write this story for her though. To let her know that being scared is okay. There is no one who isn't scared sometimes, a lot of times, and that feeling is normal........and okay. And at one time or another in our lives......we've all failed.......we've all fallen short on something we've really wanted......and again, that's okay. 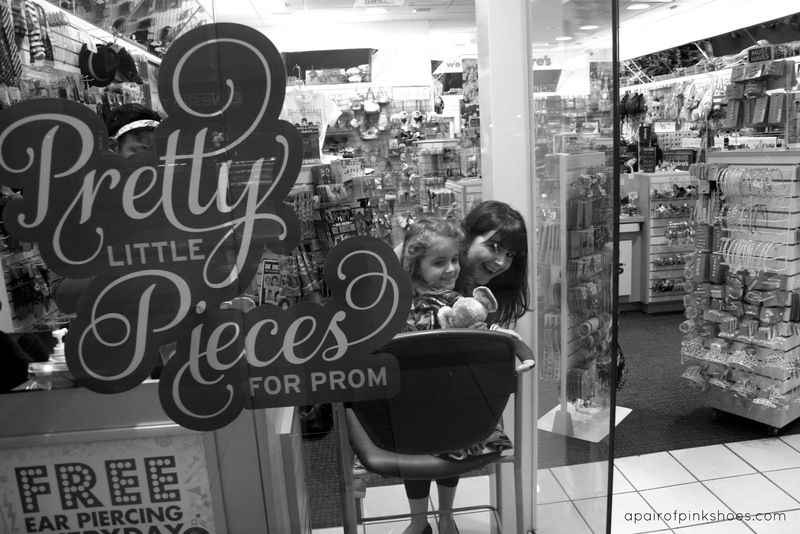 Georgia has wanted to get her ears pierced in the biggest way for about a month. She talks about it almost everyday. Multiple times. She even plays ear piercing store with her stuffed animals and some kitchen tongs. I have never brought this topic up. It's all her. She initiated it and she continued it. Chris and I have no magic age in our heads that we deem ear piercing appropriate or not and told her we were happy to take her to get it done if she really wanted to do it. 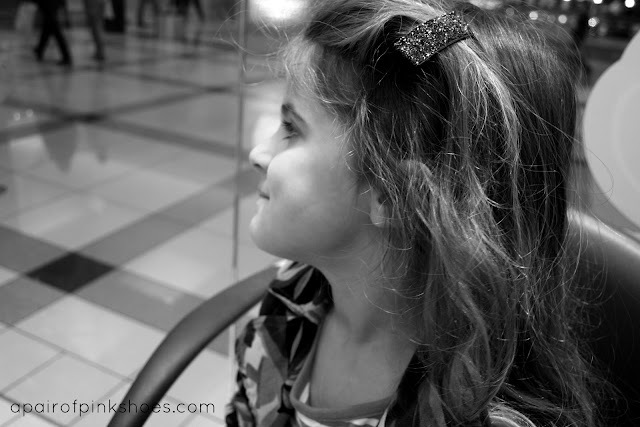 I was honest with her in telling her that sure, it hurts a little bit, but then the hurt goes away quickly and you look in the mirror and you're so excited that you have little sparkles on your ears. She seemed okay with that. Last Saturday she announced that she wanted to head to the mall after church on Sunday and do the deed. She was firm. She couldn't wait to go to bed on Saturday night so she'd wake up faster and we could go to church quicker and then we'd go to the mall. Come Sunday morning I didn't bring it up. I truly wanted this to be her decision. But sure enough within a half n'hour of being up Georgia shrieked that this was the day she was getting her ears pierced. And she repeated that shriek every ten minutes or so until we pulled into a parking spot at the mall. She practically sprinted to Claire's laughing the whole way. Chris and I kept giving each other little looks that said, "Do you really think she'll do it?" "She's surprised us before." "We'll be so proud of her." And I was telling myself, "She'll look so darn cute!" We picked out earrings, little sparkle pink flowers, and hopped up in the chair. No crack in the armor. She told Chris to take a picture of her ears. Her ears for the last time without any holes in them. As the earrings got taken out of their packaging, the sterile wipes came out, and Georgia saw the white guns placed on the counter she started to falter a little bit. And I expected that. 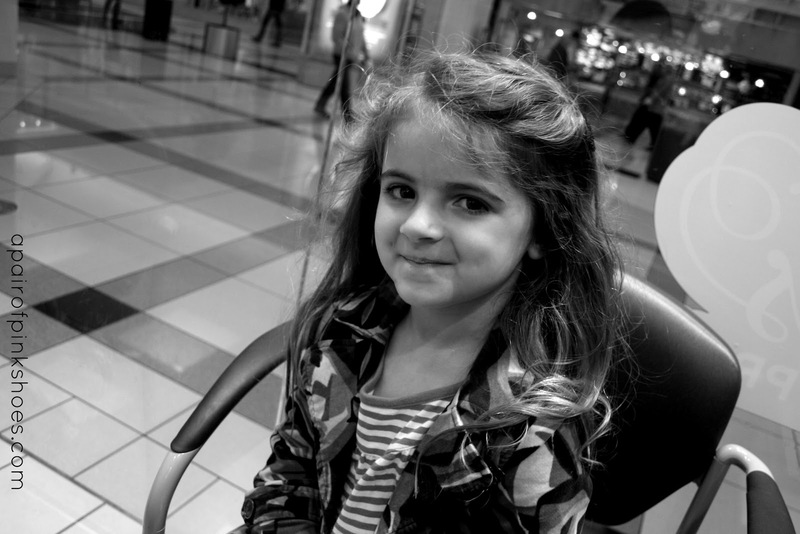 Getting your ears pierced is a 'big deal rite of passage' for little girls and as ready as you are to get it done, it's scary, and there will be tears, and last minute hesitations, and I knew that as her mom I'd probably need to do a little coaxing when it came right down to it. I knew she'd be happy in the end and we all need encouragement sometimes to do scary things that those who have gone before us know aren't really all that scary when it comes right down to it. But she started to cry harder. That kind of cry where it's hard to catch your breath. 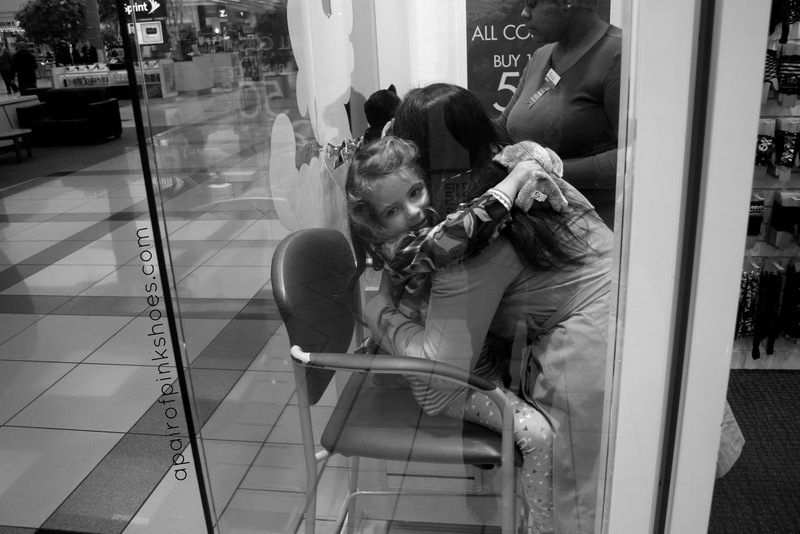 And she told me she wanted me to hug her the whole time they were piercing her ears. I told her I couldn't do that. And she cried harder and said she wanted to get down. So I helped her down. And she cried harder. Too hard to get your ears pierced. We walked out of the store for a bit to see if she'd calm down and it just got worse. When we told Georgia that it was okay, she didn't have to get her ears pierced, it was no big deal, it infuriated her. The thought that we believed she wasn't brave or couldn't do something was more than she could handle and she fell apart. And as her parents we decided that she wasn't ready....at least not that day. We scooped her up and carried her out to the car and she kept crying, huge sobs. And it broke my heart. It's the first time I've seen her truly upset that she wasn't able to do something. Not because she was physically incapable but emotionally and mentally. She couldn't get herself there and the defeat that she felt was too much for her. She calmed down over the course of the car ride home and we quickly involved her in a game of hide and seek when walked in the door. I asked her about two hours later how she was feeling about her ears. She told me that she'd stopped thinking about it and she wanted to talk to me about it tomorrow. I gave her that space. On Monday she asked me, "Mommy, when I'm a brave adult like you I won't be scared to do things will I? Like get my ears pierced. I'll never be afraid of something when I get big and I can't wait for that." I kissed her on the head and replied,"Georgia. Everyone is afraid of something. Everyone. Even grown-ups. I'm afraid of something almost everyday. And sometimes I ignore that fear and just do the thing I'm afraid of. And sometimes I'm too afraid and decide not to do that thing. And both are okay." I told her I was afraid to bring her to swimming lessons because it made me sad to see her cry about it--and nothing makes a mommy sad like seeing her little girl sad, but I did it anyway because I wanted her to be safe in the water and it is a good thing for little girls to know how to swim. And now? I reminded her how she could go under water by herself. She smiled at that. "So grown ups aren't always brave? Is that really true?," she confirmed. "Right. There is no one that is brave all the time. But a lot of times scary things are worth it. However, if you decide that it's just too scary don't do it, and that's okay, it's completely okay and you don't need to be mad at yourself for it." I continued to explain that she needed to stop being upset with herself for not getting her ears pierced; for being too scared. There would be so many opportunities to try it again and that daddy and I would take her whenever she felt ready. She says she wants to try it again on Friday. And I'm happy to help her try. I'm also happy to walk next to her if it doesn't go well. To help her see that not accomplishing a goal, failing at something, is okay sometimes. It's not the end of the world. It's not an opportunity to beat yourself up. And in the end we all do it. And goodness.....we're not going to have a meltdown over it. All this seems easy. It's ear piercing. But one day it will be a strained friendship, not making a team, not receiving an award, making a bad decision about a social situation, not getting into the college of her dreams, not landing that perfect job, or working through a problem with her own children..........the list of things we can fall short on never ends and I have to show her in these early formative years how to fall short, how to deal with it, and how to get back up. Sometimes over and over. We might find ourselves back in this chair tomorrow. If we do........fantastic. If we don't.........eh........we're learning how to fail, how to be scared, and how to say, "right now just isn't the right time...........and that's okay." Because none of us....none of us are 'big brave adults' all the time, and our kids need to know that. This post is so sweet. My Mom was not considerate with me growing up. She minimized how I was feeling whether it was scared/upset/worried/happy. It is so wonderful to see you being so considerate and loving to your young daughter and her fragile little heart. Please keep it up! Thanks Michelle! Sometimes it's so hard to do those little feelings justice when you're thinking about everything else that has to get done. But I try hard. Thanks for stopping by. I am new here and I love this post. Thank you for sharing. One of my 7 year olds is asking for her ears to be pierced on her half birthday in July. I can see this being her story as well ... it's nice to have this glimpse into the future so I can be prepared!